At almost 8 years old, we have retired Cowboy from breeding. He has been neutered and is available for sale to a rural home as a pet and farm or ranch dog. He is a great companion, loves kids, good barnyard guardian and alerts well to visitors on your property. We are asking $150 for him to cover our vet expenses from having him neutered and most recent vaccinations done in May. He is up to date on his vaccinations and is house trained, but he also does fine as an outdoor only dog too provided with a dog house or other shelter from harsh weather. *We bought Cowboy from Beaver Creek Mini Ranch in North Dakota back in July 2009. 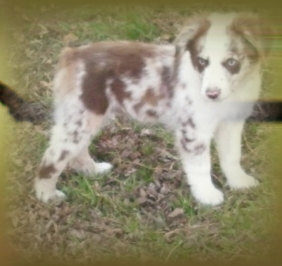 He is a gorgeous harlquin blue merle male with 1 brown eye and 1 blue/brown (split-color) eye. Cowboy came to us as a proven 2 year old sire with 2 litters already on the ground in North Dakota. He is a known producer of blue-eyed tri color puppies and has also produced puppies with red coat color. He has produced an assortment of eye colors including: two-tone and multi-color, marbling and flecks of color, along with green, hazel and gray eyes. He almost always throws strongly for copper markings and produces puppies with white markings that range for very minimal to full expression (of the Irish Spotting gene) depending on the mother's marking pattern. His puppies range in size for toy sized to large minis depending on the size and genetic background of the dam. Cowboy's sire, Duff's Grizzleys Shadow was a 10 inch tall, 10 lbs. toy male, so he carries strongly for puppies of medium to small size. In our photo of him (Cowboy in the foreground to Charlie's left) is his granddaughter, Spice Girl, who is 13.5 inches tall and weighs 16 lbs. Cowboy has produced 7 delightful litters for us since we bought him. SHOW RESULTS: Cowboy attended his first show June 20, 2010. He took 2nd place Open Dog and he also took a 2nd place on the merits of his daughters in the (non-regular) Stud Dog class. We are very please to have him do well, considering it was a new experience for all of our dog and they were somewhat overwhelmed by seeing so many other canines in one place. OTHER NOTABLE ACCOMPLISHMENTS: 3 of Cowboy's daughters (now almost 1 year old) were sucessfully training as Autism Service Dogs, Narcissa and her littermate Kindlelyn, and their younger sister, Daisy. 2 of his grand-puppies (from Kindlelyn's 1st litter) have also been placed as service dogs: Harry is in Sioux Falls working as an Autism Service Dog and his litter-sister Ember is a Medical Alert Dog in Aberdeen working with a little boy with PANDAS. Cowboy consistantly sires puppies who are extremely gentle with all people including children, highly people-oriented, excellent work ethics, with keen intelligence and an easily trainable and willingness to work. His litters also demonstrate good natural herding ability with a gentle manner for moving livestock which facilitates working with small farm animals such as alpacas, miniature horses, sheep or goats. Cowboy has the most wonderful disposition imaginable, which he throws with very high frequency in every litter he produces. We are pleased with his temperment as a member of our family, he's great with our children including our toddler-aged daughter. Based on his previous litters, approximately 1/2 of his puppies have suitable temperments for service dog work with developmentally disabled children and all his puppies making wonderful pets and working farm/herding dogs.